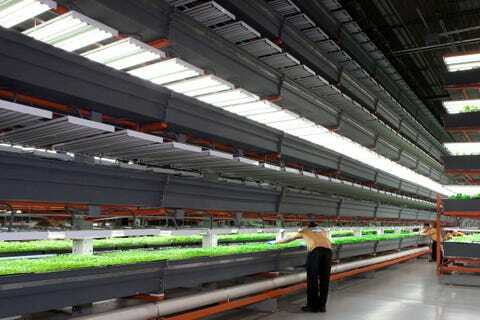 Indoor farming may be taking root. A grey warehouse in an industrial park in Indiana is an unlikely place to find the future of market gardening. But it is, nevertheless, home to a pristine, climate-controlled room full of eerily perfect plants. They grow 22 hours a day, 365 days a year in 25-foot towers, untouched by pests and bathed in an alien pink light. Critical to this $2.5m techno-Eden, run by a firm called Green Sense Farms, are the thousands of blue and red light-emitting diodes (LEDs) supplied by Philips, a Dutch technology firm. The light they give off is of precisely the wavelength craved by the crops grown here, which include lettuce, kale, basil and chives. The idea of abandoning the sun's light for the artificial sort is not new. It offers plenty of advantages: no need to worry about seasons or the weather, for instance, not to mention the ability to grow around the clock (although a couple of hours a day are necessary, says Gus van der Feltz of Philips, for the plant equivalent of sleep). Moving plants indoors allows them to be coddled in other ways, too. Water can be recycled continuously, and sensors can detect which nutrients are missing and provide them in small, accurate bursts. However, LEDs offer a host of benefits over traditional, fluorescent growing lights. For one thing, they are far more efficient, which helps to keep electricity bills down. High efficiency means less heat, which makes air conditioning cheaper. Being cooler, the lights can be placed closer to the plants, so the crops can be planted more densely. The wavelengths of the light can be fine-tuned so that lettuce is crisper, or softer, says Robert Colangelo, the president of Green Sense Farms. Your correspondent tasted soft, sweet kale nibbled straight off the plant. It was delicious. The crops grow faster, too. Philips reckons that using LED lights in this sort of controlled, indoor environment could cut growing cycles by up to half compared with traditional farming. That could help meet demand for what was once impossible: fresh, locally grown produce, all year round. Hydroponic, naturally lit greenhouses, such as those built by BrightFarms, a firm based in New York, are already supplying produce to cities such as Chicago and New York. Green Sense Farms is not the first to try growing under LEDs, and despite their efficiency, energy costs have been a challenge for its predecessors. But Mr Colangelo is confident. LEDs are becoming cheaper all the time, and the involvement of Philips, which has invested heavily in the technology, suggests that costs can fall further. Farms such as these are unlikely to be suitable for heavy crops like corn and potatoes--which grow pretty efficiently in vast fields. But if Green Sense Farms can prove its commercial worth, this form of farming could become widespread for leafy greens and other high-value crops. A new national climate assessment, published on May 6th, sets out the threats that American agriculture is facing, such as growing numbers of insects and other pests and a rising incidence of bad weather. Indoor farming is, happily, immune to both.